One of the most common questions we get asked is how to decide on a t-shirt price. The confusion surrounding this is often a result of wanting to have a competitive edge over others in your field, but also wanting to make a decent profit. This refers to the costs associated with the materials needed, including the cost per t-shirt, shipping fee, contingency for misprinted or ruined t-shirts, etc. This is your total cost per shirt. Mistakes happen, so you want to budget for errors in printing. If you mess up 1 shirt for every 100 printed, how much does each shirt now cost you? Using the same numbers as above, if you mess up 1 shirt for every 100, you are looking at a loss of $2.10. To make up for this potential loss you want to incorporate it into your calculations for price per 100 shirts. Divide 100 by $2.10 = 0.021 or 2 cents. Because you don’t want to operate at a loss, let’s round up to make it an additional 3 cents. Add this 3 cents to your $2.10 and you get $2.13 as the final cost for shirt materials, shipping and assumed printing error. This is your business, so how much is your time worth? This number varies if you have employees or contract workers, but let’s assume that you run the show on your own. How much would you ideally like to earn? Take a look at all the tasks you have to complete in order to make your t-shirt business run. Are you spending hours handling customer support, responding to emails, marketing, etc.? If so, you want to choose a wage that reflects the amount of effort and hours you put in, because inadequate compensation will make you resent working on your business. $2.13 (shirt cost/shipping fee/error) + $0.42 (wage per minute) = $2.55 per shirt. We’ve already established a cost per shirt that includes the actual supplies and your time spent, but now you have to look at your overhead costs. If you’re using a platform like Teespring, then your overhead costs might look a lot different to someone who presses shirt designs themselves. For example, the cost per t-shirt from Teespring already includes the shirt cost, shipping and handling, pressing with a design, etc. Regardless, you will have certain fixed overhead costs like internet, marketing/advertising, website hosting, phone, etc. Add up these additional costs. Divide this cost by the number of t-shirts you would typically sell in a one-month span. For example, if you sell 1,000 t-shirts each month and your overhead fees are $100, this equals $0.10. We know that each shirt is going to cost you $2.65 no matter what, so now you want to figure out what you can charge to make a decent profit. Unfortunately this element relies on what your market is willing to spend. A quick scan of your competition or other t-shirt retailers can help you discover how much your customers are potentially willing to spend. Some markets will be better than others, because it all depends on things like current market saturation, market interest, etc. Once you’ve weighed out your core pricing elements and done some market research, it’s time to choose a price. If you’re still feeling overwhelmed by this decision, fret not. We pulled sales data from two of the top online t-shirt platforms, Teespring and Teeship, to determine which price point sold the best. The results were interesting. We looked at t-shirt sales ranging from $6 per shirt up to $42. Most interesting is how low overall sales are for t-shirts priced $10 and under. The data suggests that customers don’t trust prices that are too cheap. They equate a cheap price with cheap quality, and are therefore willing to spend a few more bucks to get a better product. There seems to be a sweet spot for the optimum t-shirt price and it’s between $19 and $26. The highest number of sales were for tees priced at $22 at a mind blowing 1,818,719 sales. If you look at the number of campaigns to sales though, $23 is the optimal price. For example: using Teespring, if you print on a Hanes tagless tee, the cost per t-shirt is approximately $7.70 (including text/graphic) for 50 units. If you sold 50 units at $22.00 you would make a profit of approximately $13.60 per shirt. Running your own t-shirt business can be a great and profitable venture if you know what you’re doing. By planning ahead and acknowledging the different costs associated with it, you can build a business model that works around creating the highest profitability possible, with minimal expense. Now that you know all the elements required to profit off of your t-shirt campaign, what will you price yours at? 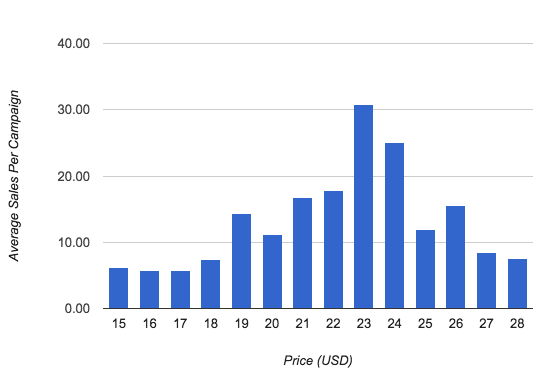 What elements were the biggest influence on your pricing decision? Be sure to share in the comment section below.